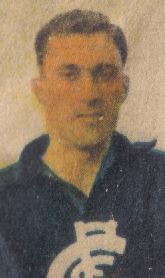 Had it not been for World War II, Alan Sorrell may well have played VFL football with greater distinction than he eventually did – given that he was almost 24 years old when he joined the Old Dark Navy Blues in 1947, after completing five years of military service. Indeed, Carlton coach Percy Bentley liked the look of the tall follower-forward, and included him among four new faces in Carlton’s team to play Melbourne in round 1, 1947 at Princes Park. Wearing guernsey number 14, Sorrell was stationed in a forward pocket as ruck partner to Jack ‘Chooka’ Howell. Another debutante, Fred Stafford took up the opposite pocket, with Ken Hands between them as the spearhead. Right from the first bounce, Carlton clicked into gear against the previous year’s Preliminary Finalists, and led by 13 points at quarter time. From then on, the game was an even and hard-fought contest, but the Blues maintained their advantage to the final siren and were worthy winners. Ken Hands was a star with seven goals, while Sorrell was handy with his ruckwork and added two goals himself. The following week against South Melbourne at the Lake Oval, Sorrell sent through his third career goal in a 14-point loss. Immediately after that, his goal-kicking efforts, as well as his playing career - came to an abrupt halt. He was omitted for round three, and couldn’t regain his place in the senior team until early August, when the Blues suffered a 40-point home ground drubbing by Essendon in round 16. Sorrell was then dropped again, and surely endured mixed emotions as the Blues topped the ladder after the home and away rounds, before snatching victory in the last minute of the 1947 Grand Final - thanks to Fred Stafford’s legendary, last-minute left foot snap goal. From then on, Sorrell became an almost permanent 19th or 20th man. In 1948, seven of his eleven games were played off the bench, and in 1949 he was a reserve seven times in nine games. His last appearance came off the pine in the ’49 second Semi Final against North Melbourne. Carlton won by 12 points to book a Grand Final showdown against Essendon, only for Sorrell to lose his place in the team for the decider. Essendon then destroyed Carlton in a one-sided disaster for the Blues, and Sorell retired shortly afterward - or so he thought at the time. Some six months later, Alan was coaxed out of retirement to make a singular brief comeback for Fitzroy against Collingwood at Victoria Park in round 2, 1950. The big man gave his all that afternoon, but Collingwood were enjoying their most dominant era. They showed no mercy to the struggling Maroons, and thrashed them by 42 points to end Sorrell's football career after 23 matches. On April 4, 2011, Alan Sorrell passed away at the age of 87, just nine days after losing his beloved wife Laurel – to whom he was married for 60 years. Contributors to this page: pblue , PatsFitztrick , Bombasheldon , WillowBlue , tmd1 , molsey , p(12)terg , dgreen2 and admin . Page last modified on Tuesday 30 of October, 2012 19:21:26 AEDT by pblue. 1990 Rd 7 - Beware the Blueboys.